Situated on the banks of River Kabini, this forest reserve is a haven for wildlife photographers and bird watchers. Kabini is around 80 Kilometers away from Mysore and is 205 Km away from Bengaluru. One of the most popular forest reserves in South India, Kabini is surrounded by lush greenery, tall trees and the presence of the river and the lake ensures that the visitors the sightings of elephants, tigers, leopards, samba deer etc. Spread over 55 acres of forestland, Kabini was once the private hunting grounds of Mysore Maharaja. During the British era, the Maharaja used to bring guests from the British Raj to Kabini to enjoy a spot of hunting. A part of Nagarhole National Park, the forest of Kabini abounds in wildlife and birds of rare origin. Kabini is also rated as one of the top five wildlife reserves in the world by the British Tatler’s Travel Guide. Kabini enjoys a moderate climate all through the year. The best time to visit this forest reserve would be from the months of November to June. Summers are a busy period around this forest reserve as the wildlife is teeming with hoards of elephants, deer, tiger, leopard, and panther that come to drink water at the lake. During winters, the maximum temperature in this region is around 32 degrees and during the summer the temperature can rise up to 37 degrees. Nearest The nearest station is at Mysore where all major trains from important cities take a stop. There is a reason why Ooty is called the ‘queen of hills’ and that’s what makes this place so utterly popular and appealing. The cool misty mountains, the rugged roads, the green canopy of plantations and the crisp morning air of this hill station are alluring enough to act as a beaconing light. Located in the enchanting Nilgiris, some of the places that ought to be visited in Ooty would be – Ooty Lake, a trip down the botanical garden, Dodabetta Peak, Rose Garden, Emerald Lake, Dolphin Nose etc. A popular holiday spot, Wayanad is the favorite destination for honeymooning couples. Located in the north-east of Kerala, Wayanad offers pleasant misty mountains, cool fresh air, verdant greenery and enchanting plantations for one and all. There are many places to trek around in Wayanad and many viewpoints to drink in the beauty of nature. Chembra Park, Thirunelli Temple, Banasura Sagar Dam, Lakkidi View Point, Soochipara Falls, Edakkal Caves, Banasura Hills, Meenmutty Falls, and Wayanad Wildlife Sanctuary. A weekend destination that offers serene misty mountains, quaint homestays and lovely weather to rewind and rest! Located in the Malnad region (Karnataka) of the Western Ghats Sakleshpur is surrounded by lofty green hills, plantations and pleasant locale that would please your senses. If you love to trek then Sakleshpur must be the next destination in your itinerary. Some of the places that you can check out here are – Manjarabad fort, Bisle ghata, Jenukal Gudda, Hemavathi Backwater, Kukke Subrahmanya Temple, Belur-Halebid. A trip down to the misty plantations of Coonoor makes a great getaway any day! Located at an altitude of 1,850 meters above sea level, Coonoor is the second largest hill station in Nilgiris after Ooty. A lovely place for trekkers and trekking expeditions, Coonoor has a mild-moderate climate that makes it a perfect weekend destination to relax and rejuvenate. There are many places of interest to visit in this hill station – Sim’s Park (where there are over thousand species of plant varieties), Dolphin Nose Viewpoints, Droog’s Fort and Law’s Falls are some of the places that one can check out while visiting Coonoor. A perfect offbeat destination, Kotagiri is located 1793 meters above sea level in the Nilgiris Hills. An often-overlooked destination spot, Kotagiri has the second best climate in Tamil Nadu. A lovely getaway for those who want to spend a peaceful weekend, Kotagiri has much and more to offer. Some of the many places that one can visit here are Kodanad View Point, Catherine Falls, Rangaswamy Peak and Pillar, Elk Falls etc. 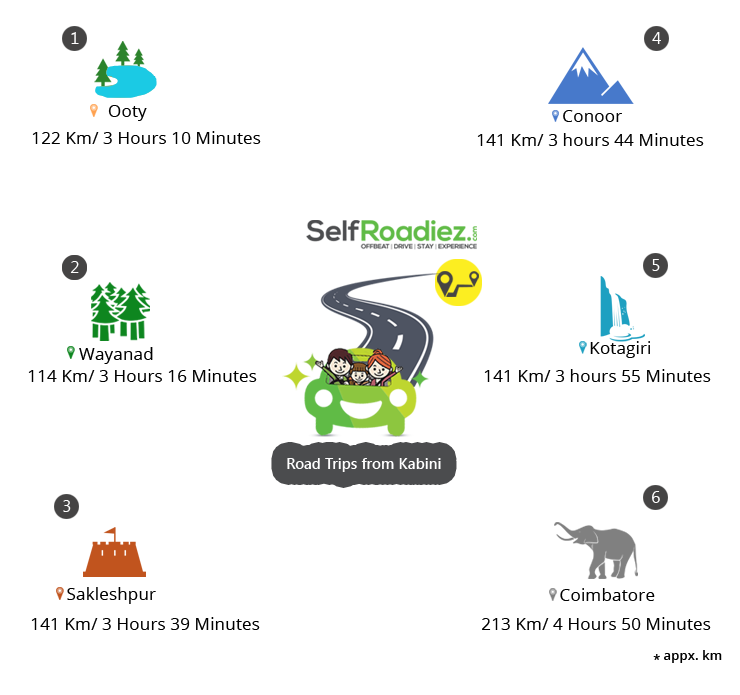 Kovai or Coimbatore is primarily an industrial town but it is also an offbeat destination that offers much and more to its visitors. Coimbatore is also known as the ‘Manchestor of South India’ due to the many textile industries that operate here. Some of the place of interest that one can visit here are – Dhyanalinga Temple, Maduramalai Temple, Monkey Falls, Vydehi Falls, Kovai Kutralam Falls etc. There is no dearth of things to see in Kabini. The forest reserve teeming with life is a great place to look for rare birds. Jungle Safari is a treat that one shouldn’t miss. Drive deep into the jungle and see if you are lucky enough to spot a tiger. The elephant safari will take you through terrain that a jeep cannot traverse through. Enjoy a leisurely colonial afternoon and hunt for a tiger, albeit with your camera. The Kabini River Safari is a treat for birdwatchers and naturalists. Spot rare species of birds and take a close look at their habitat as you enjoy a leisurely river trip through Kabini. One can also make a day trip to Bandipur National Park tiger reserve, Masinagudi, Mysore, BR Hills, Bangalore, Srirangapatna etc. Accommodation in Kabini veers from luxury to adventure depending on what suits your temperament. From ecological cottages to river lodges, tented cottages to tree houses you will find an adventure at every step of the way. Once a colonial estate, the large 54-acre property is on the banks of the river Kabini. 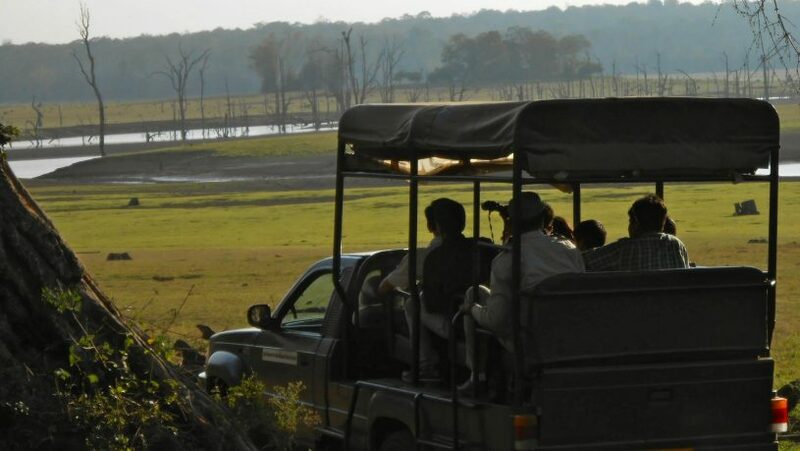 The Lodge offers morning and evening jeep rides to enable guests to spot some wild animals. A coracle ride on the Kabini River is another thrilling experience awaiting guests. Immaculate and luxurious lodging in the form of four deluxe rooms and two extravagant tents. The colonial-styled rocky exteriors are perfectly in sync with nature. Low-impact tourism is practiced here and the resort sustains the surroundings with annual plantings of native trees in the pursuit to maintain the biodiversity. Renewable energy sources are used effectively. The property has taken up groundwater recharging and biogas plants in an attempt towards preserving the environment. Rooms in this colonial-style resort have immense glass windows on the walls drawing in panoramic views of the serene Brahmagiri Hills, the Kabini, stunning tree lines, and the infinity pool. All rooms offer a view of the Kabini River from their private decks and are tailored to suit families, couples, and groups. Kabini is a great destination, especially for kids. A great opportunity to see animals in their natural habitat, Kabini is an exciting prospect for children who will learn many things about nature, wildlife, conservation and preservation of forests. For many naturalists and wildlife photographers spotting a tiger at Kabini is like finding the Holy Grail! A perfect summer destination for kids, Kabini is the right place to teach your children about conservation of forest and the importance of endangered species such as tigers in the global food chain.